The field of endoscopic management of obesity is fast growing with numerous intra-gastric balloon devices being developed. This modality of obesity management has been an option for an obese patient that have failed to lose weight following a dietary and lifestyle adjustment, and those who prefer a noninvasive procedure to the bariatric surgeries. Among the numerous types of intragastric balloon available for the endoscopic management of obesity, Spatz Adjustable Balloon System is one of those that have demonstrated the effectiveness and minimal side effects. Though yet to be approved by the FDA, Spatz Adjustable Balloon system is available for commercial use in over 32 countries including Mexico. 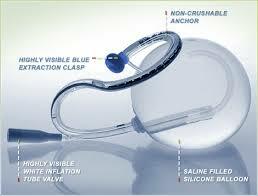 It is the only intragastric balloon device that is being used for up to 12 months. It has the advantage of been adjustable i.e. the saline quantity can be adjusted. It is a silicone balloon that is inflated with saline (salt water). It includes a filling catheter, which is extractable endoscopically, that permits an intragastric volume adjustment of 400-800 MLS. The volume of the intragastric balloon can be modified to improve the patient’s tolerance and increase weight reduction (Kim, Chun, Choi, Kim, Keum & Jeen, 2016). The indications and contraindications for Spatz Gastric Balloon areas for the gastric balloon in general. Following implantation of this device, you may experience discomfort nausea and vomiting within the first week of placement necessitating the use of certain medications. Your doctor may place you on a liquid diet immediately after the implantation for the next few days before you are allowed to move on to semi-solid and solid foods. It is also important to adhere strictly to the dietary and lifestyle modification plans as prescribed by your doctor/nutritionist to ensure optimal weight loss. In a 12 months pilot trial, 18 patients with mean BMI of 37.3kg/m2 were implanted with the Spatz Adjustable Balloon system (ABS) for 12 months. The volumes of the balloon were adjusted either for intolerance or plateau in weight loss measurement. Mean weight loss at six months post-implantation was 15.6 kg with the percent of excess weight loss EWL of 26.4%. At 12 months post-implantation, the mean weight loss was 24.4 kg with percentage EWL of 48.8% at 52 weeks (Machytka et al. 2011). In another study conducted in the UK, the mean weight loss was 21.6 kg while the percentage EWL was 45.7% (Brooks, Srivastava, & Mathus-Vliegen, 2014). Interested in Mexico Gastric Balloon? Fill out the application below to learn more about undergoing the procedure in Tijuana, Mexico.